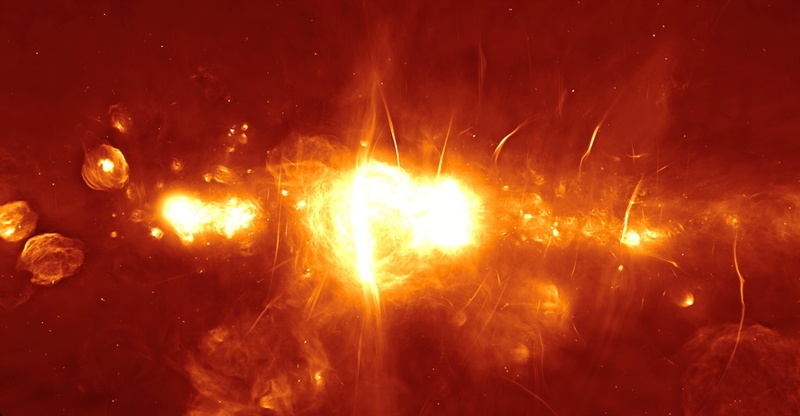 The clearest image yet of the centre of the Milky Way galaxy has been released from South Africa’s shiny new radio telescope, MeerKAT. This R4.4 billion, 64-dish radio telescope listens to the relatively weak signals from space to help scientists understand what is going on in the far reaches of the universe. “The centre of the galaxy was an obvious target: unique, visually striking and full of unexplained phenomena – but also notoriously hard to image using radio telescopes” said Fernando Camilo, chief scientist of the South African Radio Astronomy Observatory (SARAO), which built and operates MeerKAT. 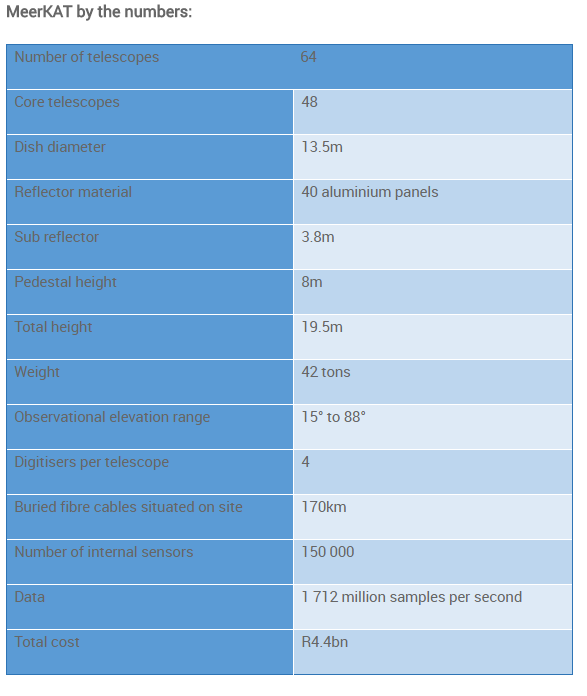 It will eventually become part of the Square Kilometre Array (SKA) which will be 50 to 100 times more sensitive than any other radio telescope on earth. The composite captures the central region of the Milky Way, 25,000 light-years away from Earth and lying behind the constellation Sagittarius. It features a massive black hole, measuring 4 million solar mass. 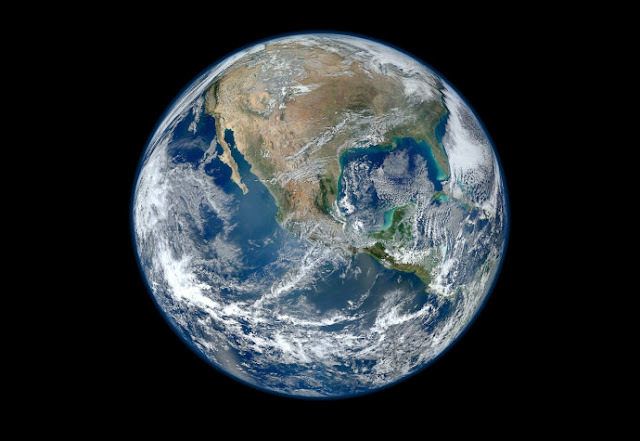 Solar mass is a unit of measurement which is equal to the mass of the sun, about 333,000 times the mass of the Earth. “Although it’s early days with MeerKAT, and a lot remains to be optimised, we decided to go for it – and were stunned by the results,” said Fernando Camilo. Notoriously enshrouded by clouds of gas and dust, this region is invisible from Earth using ordinary telescopes. The MeerKAT has allowed astronomers to view this distinctive region using infrared, X-ray, and radio wavelengths. International researchers have lauded the image quality of the MeerKAT, and it's already begun to answer three-decade old questions. The panorama corresponds to an area of approximately 1,000 light-years by 500 light-years. “This image is remarkable,” says Farhad Yusef-Zadeh of Northwestern University in Evanston, Illinois, one of the world’s leading experts on the mysterious filamentary structures present near the central black hole (but nowhere else in the Milky Way). “The MeerKAT image has such clarity. It shows so many features never before seen, including compact sources associated with some of the filaments, that it could provide the key to cracking the code and solve this three-decade riddle,” said Yusef-Zadeh. The MeerKAT can process up to 275 Giga bytes per second. Data is processed in real time by a “correlator”, followed by a “science processor”, both purpose-built. After further offline analysis, images of the radio sky are generated. 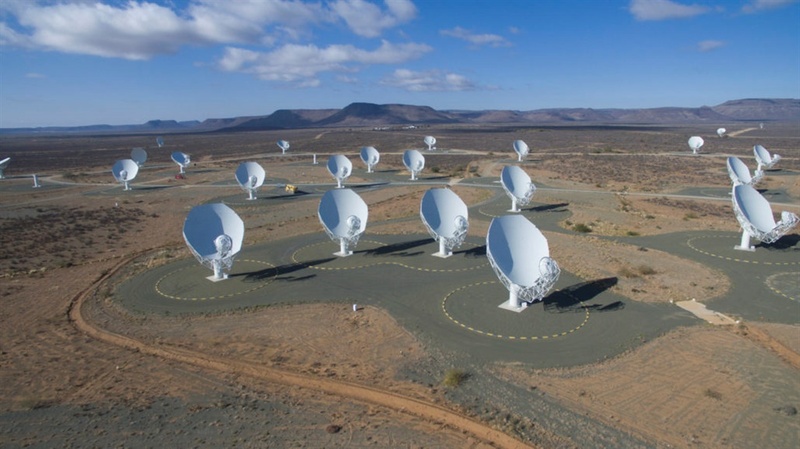 While the MeerKAT is a local project, it forms part of a larger vision to grow radio astronomy on the continent and is intended to dovetail with the mammoth SKA which will consist of about 3,000 linked radio telescopes. It has taken a decade to design and construct the MeerKAT. The MeerKAT offers a view of the sky not available in the northern hemisphere.